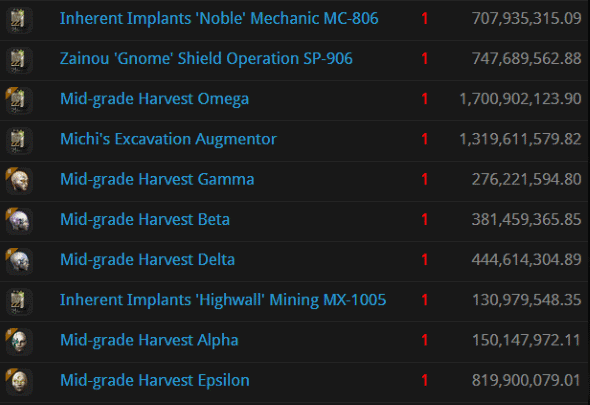 There's a lot of bad people doing bad things in highsec: Botting, bot-aspirancy--you name it. How do we cleanse New Order territory? Well, it turns out that the Code is the best disinfectant. It's amazing how quickly problems get cleared up, when the Code is applied. But don't take my word for it. Here are some real-life examples from the week of February 26th @ 00:00 EVEtime through March 4th @ 23:59 EVEtime. AG GREY proved himself to be a monster. 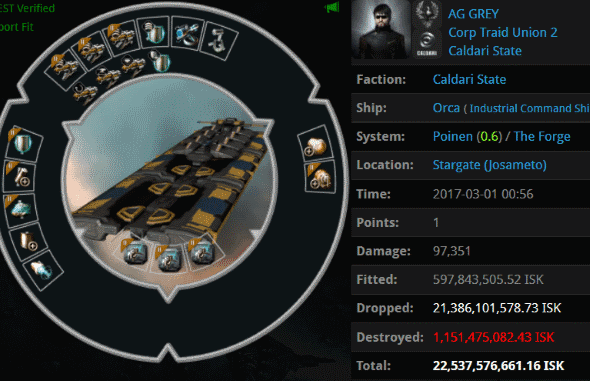 His 22.5 billion isk fail-fit Orca scandalized highsec. Agents Pod Destroyer Molly, Luna Nightblood, Tax Collector Kittens, Ralliana, Taxman Daniel, Tax Collector BokChoy, Tax Collector HongMei, Tax Collector Richard, Tax Collector Hill, and Tax Collector Aruka performed a much-needed audit. Most of the contraband's value came in the form of Multiple Pilot Training Certificates. 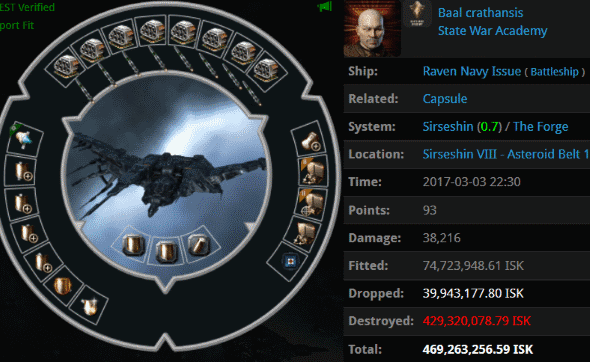 What a waste of isk. The only training this illegal hauler should have invested in is reading the Code. Even the Anti-Gankers couldn't defend the carebear's reckless actions. sam hassan was featured last week for his 200 million isk fail-fit Retriever. 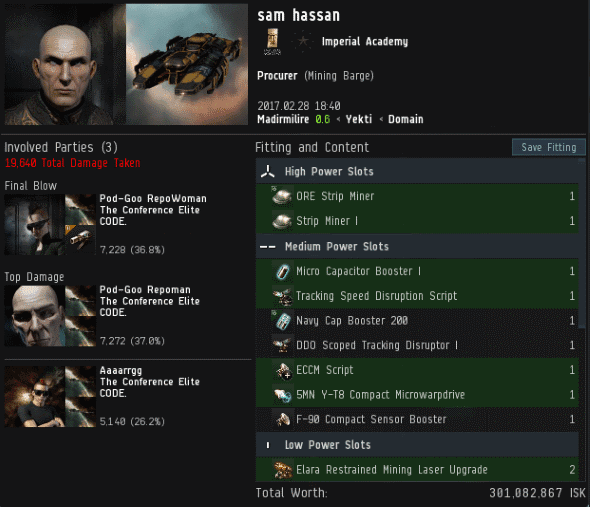 Looks like sam failed upward, to a 300 million isk Procurer. Agents Pod-Goo Repoman, Pod-Goo RepoWoman, and Aaaarrgg supplied him with another civics lesson. I wonder what sam will try next? There's been a spike in decadent Deep Space Transport ships of late. Could the freighter pilots be trying to hide their expensive cargo in less conspicuous vessels? Ekkerhart didn't realize that our Agents leave no stone unturned in their quest for highsec perfection. Agents Tax Collector Kittens, Pod Destroyer Molly, Tax Collector BokChoy, Taxman Daniel, Tax Collector Hill, Tax Collector HongMei, Tax Collector Richard, Tax Collector Aruka, and Tax Collector Discotime collected billions more isk from this audit. Needless to say, a Bustard is not a good ship for hauling blueprints. Especially while AFK. Speaking of AFK, Raven Shadows heard that Uedama was a trendy place for bot-aspirant carebears to hang out. She heard wrong. 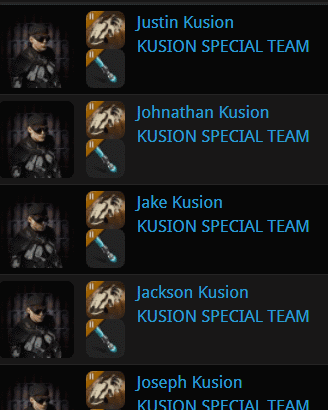 The KUSION SPECIAL TEAM was called into action, deploying an elite force consisting of Agents Justin Kusion, Johnathan Kusion, Jake Kusion, Jackson Kusion, Joseph Kusion, Joel Kusion, Jayson Kusion, Jayden Kusion, Joshua Kusion, Jeremiah Kusion, and Jason Kusion. 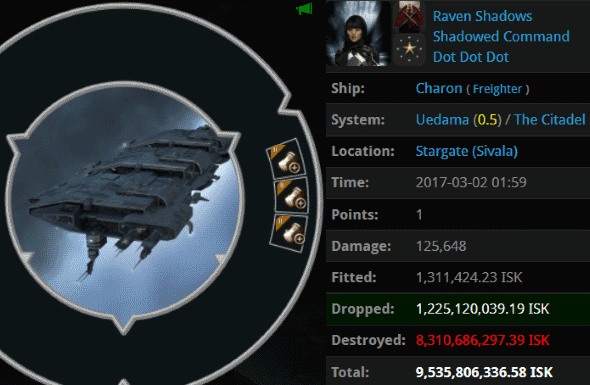 ...Yes, this was a gank ship. Baal opened fire on Agent Salah ad-Din al-Jawahiri's scout alt, which wasn't suspect at the time. 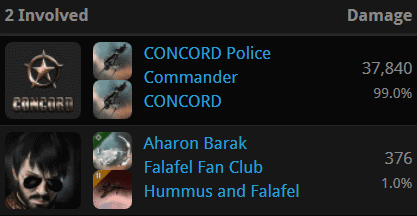 Agents CONCORD Police Commander and Aharon Barak retaliated. 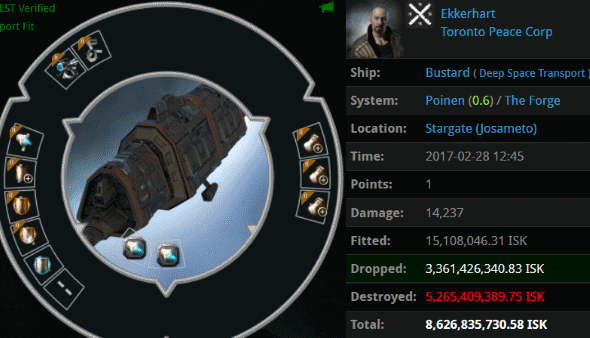 After losing his freighter during Burn Jita, Captain Static got podded by Agents The Eggsecutioner (heh) and Oneill HGM. 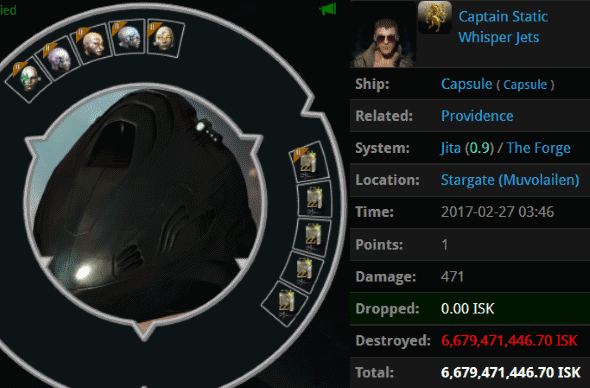 Captain's 6.6 billion isk pod was, you might expect, another one of those Ascendancy sets we've been seeing lately. Nope! It was a true mining fiend's pod, complete with a highly illegal Michi's Excavation Augmentor. Bot-aspirant freighters and bot-aspirant miners--they're all the same. Who are you? You should sign with your character in game. If you are not too chicken. He got banned for being super bad and toxic in the game. Hes a troll. That's what he does for a living day in and day out. This is Big Baal Crathansis, by the way. And I called you a coward! But we DIDN"T fail. We did better than ever! "He got banned for being super bad and toxic in the game. Hes a troll. That's what he does for a living day in and day out." I first noticed AG Grey and his alt AG SKIF hanging around Geras. I killed AG SKIF who was ironically piloting a Hulk https://zkillboard.com/kill/59620218/ and said to myself--this guy is a bot-aspirant! Little did I know how bad it really was. Congratulations on nabbing him! That Michi's pod was a highlight of Burn Jita--I recall much rejoicing over it. 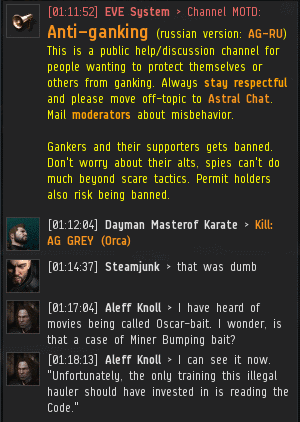 After his loss, Captain Static bought a special exemption permit for one billion ISK in order to be safe for the rest of the event. fake news. Don't believe it! Meh. Seems made up. Like those HSM Admiral Chief guys that keep getting blown up. Just cause you got AG in your name don't make you AG, just like having HSM in your name. But hey, if it makes you feel better about yourselves who are we to dictate how you play. You guys keep trying, you'll get there. You are correct, anon 433. Having ag and hsm in your name doesn't make you either of those things. You have to dedicate yourself to failing non-stop, daily. It takes true effort. What's with all the ranks for first names? What are you guys going to do when you get promoted??? Another week of non-stop failing from AG. so glad you were here to see it sir!